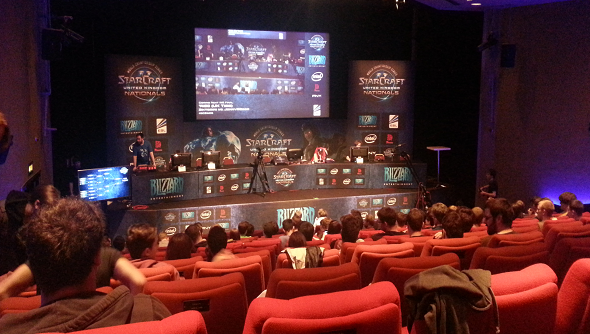 Blizzard’s travelling Starcraft II show, the World Championship Series, came to the BAFTA HQ in London this weekend. Hosted by the ESL, and casted by the dulcet tones of Tastosis, the series pitted the best UK players against eachother for a spot in the World Championship finals. Hello. You’re reading the Starcraft channelat PCGamesN. We’re a new site that combines original journalism, user submissions and the best headlines from across the web. Feel free to comment or follow us on our Starcraft Twitterfeed for regular updates. The prize pool for the event was a comparatively modest $15,000 and was distributed thusly; $6,000 to first place, $3,000 to second and third received $1,350. But for players at this level, winning seems less about the money and more about the all-expenses-paid trip to Stockholm for the European finals of the WCS in September – the prize pool for which is $60,000. With over 23,000 people tuned in to Twitch TV’s stream of the final between Ziktomini and DeMusliM, the event was a triumph for eSports in the UK. Casting duo Tastosis – who commentated the entire event – said that they were surprised at the level of play and looked forward to seeing what the Brits bring to the table in the later stages of the tournament. The next European country to host nationals will be France. Expect Stephano to put on a show. The first day of the tournament proceeded mostly as expected; top tier players like DeMusliM, JonnyREcco and Ourk moving through their games with relative ease, while lesser known players were shunted out of the competition. But there was one British Starcraft II pro who failed to live up to the name he has created for himself; BlinG. BlinG won his first match against Shibbxyz 2 – 1 but came a cropper against DeMuslim – he lost 2 – 0. That wasn’t unexpected: DeMusliM was the favourite to win the tournament. But when BlinG dropped into the losers’ bracket and faced the practically unknown Simba, he lost 2-1 and was ejected from the competition. A huge blow. The first tussle between two of the UK’s best yieldedinteresting results. The first game took placeon Daybreak. DeMusliM opened with gas while JonnyREcco stuck to a standard hatchery build. REcco skilfully deployed fungals on DeMusliM’s bio units and expanded to five bases. After maxing out, REcco took down DeMusliM’s planetary with the help of Brood Lords, causing the Terran to GG. Game 2, played on Cloud Kingdom, saw a shaken DeMusliM open again with gas. Similarly,JonnyREcco repeated his opening from the last game. Againdisplaying his skills with fungals, REcco wrecked one of DeMusliM’s small bio forces, but couldn’t preventDeMusliM from securing his fourth. REcco, who had built a Brood Lord/Corruptor/Infester army while creating a swarm of Ultralisks, moved into DeMuslim’s third base resulting in a second GG. JonnyRecco was through. Day 2 – Six become one. The early stages saw the six remaining players from day one whittled down to three. Lau was eliminated by DeMusliM and Phamut by Ourk and Ourk in turn by DeMusliM. The final standings: DeMusliM, JonnyREcco and Ziktomini. After his win against DeMuslim, Jonny was paired against Ziktomini – the Brit who defeated Stephano in a ZvZ. The match went to three games. The first brought victory to JonnyREcco after a base trade. In the second game, it seemed as though Ziktomini had sussed REcco out. Despite another base trade Ziktomini’s Ultralisks caused too much damage to REcco’s economy. He had no choice but to GG. In game three, Ziktomini displayed some extraordinary micro, when he managed REcco’s Banelings with a controlled Zergling attack. But JonnyREcco responded, showcasing his fungals. Soon, the players were at max economy – and gradually Ziktomini overwhelmed REcco. Ziktomini was through. It was a staggering match: Tastosis later said that it was one of the best ZvZ matches they’d ever casted. The all important fight, via the losers bracket, for a place in the final and a guaranteed $3000 was a day one rematch: Jonny vs DeMuslim. In game one, DeMusliM corrected his earlier mistakes by building up a force of siege tanks. DM pushed on to Zerg’s fourth base, and was about to take out his third, at which point Jonny called it quits. The second game on Daybreak was no less spectacular. DeMusliM opened with three factories and began mass producing hellions. Brave, but a mistake. As the game reached its conclusion, Jonny switched to Brood Lord tech and whilst sending a second army to deal with hellions and siege tanks. DeMuslim quickly moved into Jonny’s third base, but by then the Brood Lords had already hatched. DeMuslim’s army was caught out, leaving his fourth exposed to a Roach invasion. DeMuslim GG’d. Game three: and JonnyREcco opened with guerilla Baneling mines – taking out a significant clutch of marines and marauders. But it wasn’t to be: DeMuslim maintained pressure via smaller engagements, and then pushed into Recco’s third and fourth. DeMusliM was through to the final. No questions, no arguments: this match was incredible. DeMusliM chose to move to reactor Hellions whilst Ziktomini concentrated on a fast expand, masterfully spreading creep across Antiga Shipyard. As the creep reached the centre of the map, Ziktomini took a fourth base, all while his gooey sludge denied DeMuslim a fourth of his own. Then, in an outrageous play, Ziktomini morphed fifty Banelings and rolled them right into DeMusliM’s third. DeMusliM response, a march on Ziktomini’s third, was met face on by an army of Ultralisks and Banelings. DeMusliM GG’d out. Game two was a far simpler affair. DeMusliM dropped onto the third base of Ziktomini with enough tanks, marines and Medivacs to overwhelm Ziktomini’s zergling and Baneling forces. Realising that the game couldn’t go any further, Ziktomini quickly GG’d. Game three began with each player fast expanding on Tal’darim Altar. Both players chose a fast expand. Ziktomini built a roach warren, while DeMusliM again opted for reactor Hellion. DeMusliM failed to scout the roaches, and he left his natural exposed. When Ziktomini moved in, DeMusliM moved out. Zikitomini had won. In an interview following the award ceremony interview, Ziktomini said that he was ready to take out more big players in the future. He’s training full-time and is hoping for “…more Zerg buffs”.